Sylvie was born on November 2, 2012. At the hospital we noticed that her left lower leg had a pronounced bow, but all of the doctors and nurses told us that this was normal for a newborn and that it would straighten over time. Four months later several café-au-lait spots had appeared on Sylvie’s skin and her left leg was even more bowed; we knew something wasn’t right. 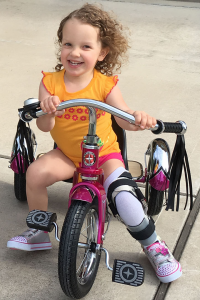 Sylvie was diagnosed with Neurofibromatosis type 1 (NF1) and Congenital Pseudarthrosis of the Tibia (CPT) - a rare complication of NF1 that meant that her left tibia was very prone to fracture with little hope of healing. We were referred to the Scottish Rite hospital in Dallas, the number-one-ranked pediatric orthopedic hospital in the country. We were determined to get her the best care possible so we started her care immediately, hoping to delay the chance of a fracture (and surgery) as long as possible. 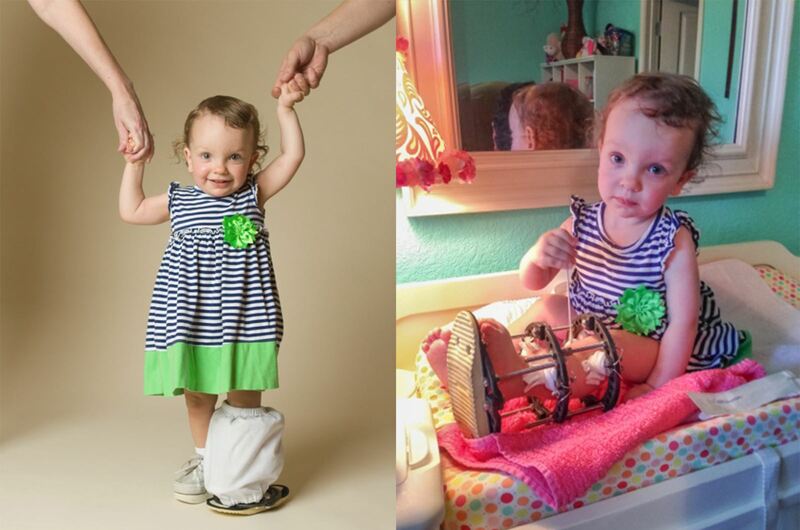 Despite our efforts, Sylvie fractured her tibia and fibula 3 weeks after her first birthday while simply standing in the bathtub. 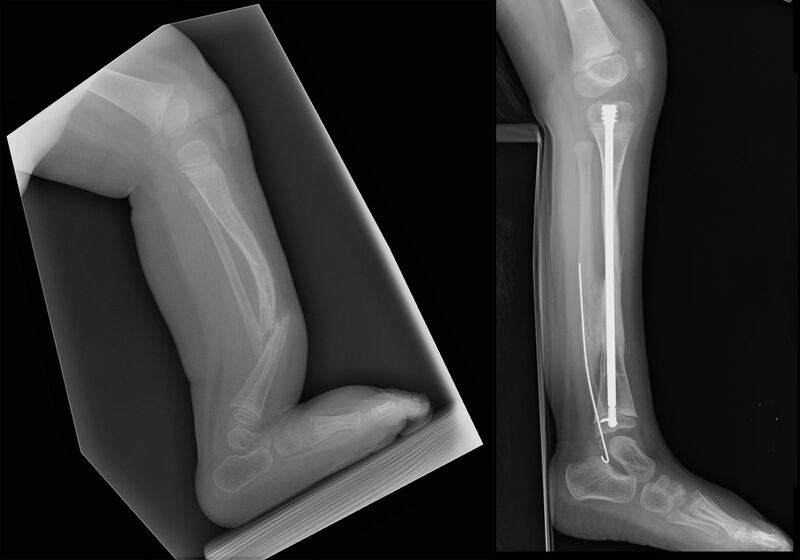 Eight weeks later the bones had not healed and the fracture was too unstable to delay surgery. Our doctor at Scottish Rite indicated there was a 50% chance of achieving bone union with surgery and a 100% chance of a re-fracture even if union were achieved. There were some suggestions that amputation might be the better option to save her from a childhood of many painful surgeries and lengthy periods of immobilization - all with a limited chance of long term success. We had a hard time accepting that the available treatment options offered such a poor prognosis and we were very reluctant to amputate our child’s leg knowing that better treatments could be available in 5 or 10 years. What we didn’t know was that a better treatment was already available at the Paley Institute. After reading about Dr. Paley’s aggressive and successful treatment protocol for CPT and talking with other CPT families who were patients, we flew to Florida to meet Dr. Paley. During our consultation he took the time to explain his treatment for CPT including the methods he employed and his reasons for doing so. Dr. Paley answered all of our questions without rushing us, and we scheduled the surgery immediately. 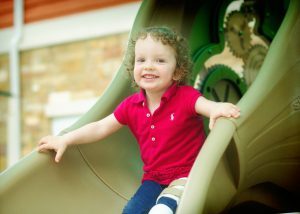 For the first time since Sylvie’s diagnosis we were optimistic about her chances of having a normal childhood. We walked out of the Paley Institute with immense feelings of hope and relief in stark contrast to what we felt the first time we left Scottish Rite. Sylvie’s surgery went as planned and her bone achieved union just 6 weeks after surgery - a new record for Dr. Paley at the time. Since then she has had one minor touch-up surgery and one rod replacement and she is doing great. Sylvie wears a brace for protection, but she has no activity restrictions - something we never thought would be possible before we found Dr. Paley! Sylvie playing like any other kid her age! Traveling out of state for your child to receive treatments and surgeries to correct a rare limb deformity is not easy; the road is long and it can be challenging at times. We spent a month in Florida for Sylvie’s first surgery and made a total of five trips to West Palm Beach that year. Sylvie battled 5 infections while in the external fixator, one of which put her back in the hospital for four days, along with nightly pin cleanings – painful for both her and us! 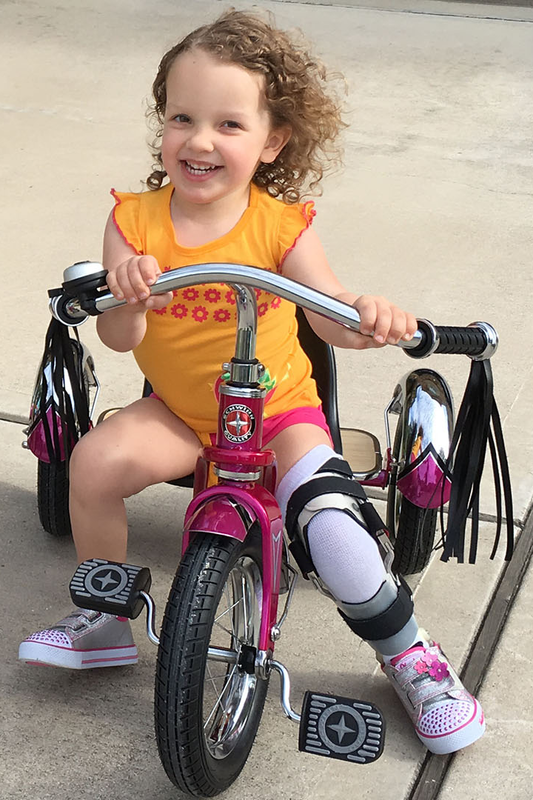 We know to expect at least one more rod exchange and possibly a lengthening surgery; however, when we see her on the playground with the other kids her age and being able to do whatever they do, we know that saving her leg and choosing Dr. Paley was definitely the right decision.